My Lucky Finds & A Birthday! Love this color combo and this Mom on the Go formula of a skirt, top and ballet flats, works every time! So happy to have thrifted this black Loft skirt , as with the weight loss, I have been really missing this basic. Have to note that I love that the top three buttons work, but the remainder of the skirt is sewed down, so none of that gaping that can happen with button down skirts! 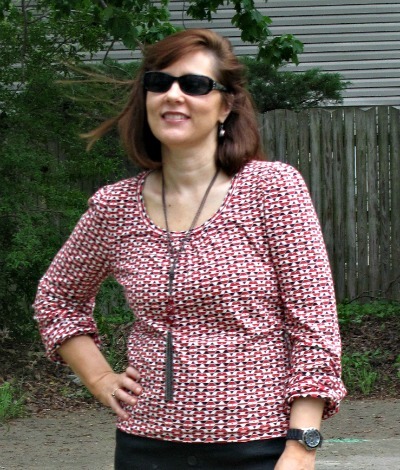 Just wanted to note that I added this long tassel necklace that I picked up from Burlington Coat Factory to help elongate and change up the square lines created in this top and skirt. I could have added a belt or scarf for other options to break up that silhouette. Would also like to note that if you are lucky enough to live near a Burlington Coat Factory and haven’t thought of them for jewelry, they are a great resource with prices similar or less than Forever 21 and quite often I can find necklaces ranging from $5.99 to $ones like this which was #12.99. Dear Readers, I hope you are all having a wonderful weekend and at peace that the fiasco in Boston ended in an arrest. We must remember that there are so many victims still suffering the loss of limbs and the new life they must now face. I continue to pray for them. In other more personal new, I have really embraced working out these past two weeks and love the intense focused strength training. I will add back in cardio after a good six weeks on my current routine. It is tough. but I love it and the feeling in my muscles. It isn’t just about weight loss it is about being in great shape! Do you like strength training with weights, Pilates or yoga? I am doing a combination of all three. Or do you embrace Cardio? , although a necessity harder for me to embrace. Or are you good at combining them both? Or do you need to do start to exercise? Gratitude: I am grateful that my husband got off work early last night and was able to join us for the birthday celebrations and the movie instead of putting of the movie until today when he would be able to join us. I am grateful for the tireless efforts of Boston and Federal law enforcement. I am grateful for quality time with my guys! I am grateful that everyone is still asleep (except my husband who is at work) and for the quiet time to put this blog post together.